Advantages: Impressive coverage with many previously unpublished images; technical drawings in both 1:72 and 1:48 scales; quality artwork representing 3 aircraft profiles. Conclusion: A publication that provides a wealth of information for enthusiasts of one of Anthony Fokker’s lesser known aircraft. What happens if you stretch a Fokker D.VII? The latest Windsock Datafile will show you that you get a two-seater version of this famous fighter that saw much service post WWI. It flew in the Netherlands and Denmark and examples were even supplied to Russia, Spain and the United States. It was fitted with various engines and undertook a multitude of modifications. As a result, its appearance could vary quite considerably. Both the C.I and C.I/”Lynx” are described by Colin Owers and he does this in the latest Datafile from Albatros Productions. The usual format is followed with 36 pages contained within the soft card covers. A remarkable collection of photographs has been gathered for this issue. Most are previously unpublished and will be new to even the most diehard enthusiast. They number over 90 and are reproduced to a very high standard. Amongst these are plenty of shots of the “naked” airframe, which should prove of interest to the detailer. Marty Digmayer provides 5 pages of technical drawings and these can be found in both 1:72 and 1:48 scales. These represent the Fokker C.I, and C.I/”Lynx”, with additional views covering the internal structure and lower axle fairing. As an added bonus, the original Fokker factory drawings are also included, which show the interior layout in side elevation. Colours profiles are courtesy of Jerry Boucher and he provides his usual competent work. There are 3 options displayed as well as the example seen on the cover. The narrative is excellent while the technical aspects of the airframe are being described, but appears a little disjointed when it comes to the aircrafts’ service life. This isn’t the author’s fault as it’s more to do with a lack of information which would otherwise allow the writer to fill these gaps. The book is rounded out with specifications of the BMW-powered, Hispano-Suiza powered, and Mercedes- powered Fokker C.Is. 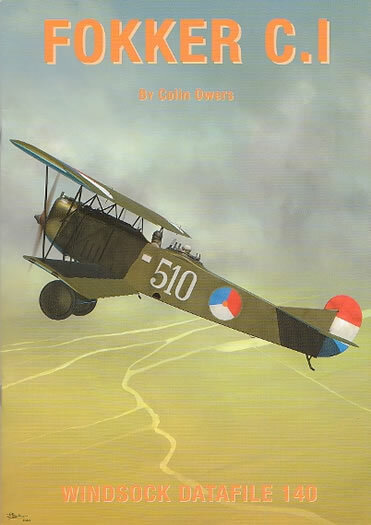 If you have an interest in any aspect of the developed two-seat Fokker C.I, then this is the publication for you.